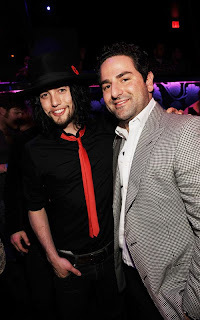 Jackson Rathbone celebrated his birthday at The Bank in the Bellagio Hotel in Las Vegas on Friday night. There were a few more pics here , but I chose not to post them, since they were doing a fairly good job of hiding the pretty (i.e. they weren't too hot, imho. That facial hair just doesn't do it for me... AT ALL! Makes me shudder & not in a good way. As I told one of my guy friends, just because you CAN grow facial hair, doesn't mean you SHOULD. After all, just because I CAN grow my leg hair, doesn't mean I WOULD!). 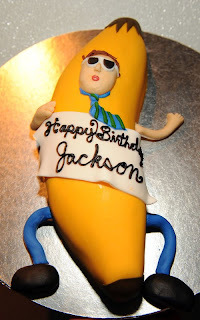 So here is a pic of Jackson with another dude & one of his banana... cake, that is. In case you didn't know, Jackson turns 25 on the 21st of December. Happy Birthday, dood! Have a good one. Also, I'm sure you all know already, but if you didn't know, 100 Monkeys have a free download of their song Keep Awake on their website. Click here to go to the link.